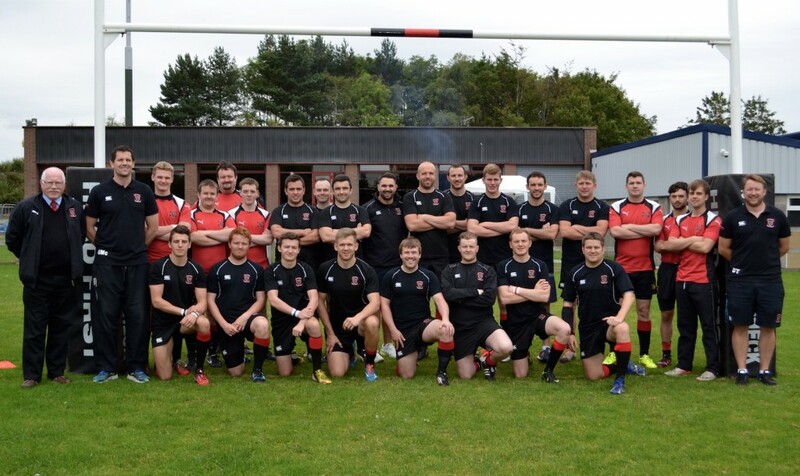 Linlithgow RFC played the last of the Club’s pre-season games geared to giving as many players as possible a chance to sharpen up for the season ahead. The Reds entertained Carrick at Mains Park, with the game, as is now traditional, forming the centre-piece of Volunteers’ Day, when the many volunteers required to sustain the Club’s activity on and off the pitch are invited for a barbeque and refreshments as a thank-you for all their efforts. Chris Bredin, the new Club Captain, led out the Reds and the home side soon found themselves under pressure as Carrick settled more quickly. A good Carrick move up the left saw their winger sell a dummy but as he ran towards the try line he put a foot in touch. 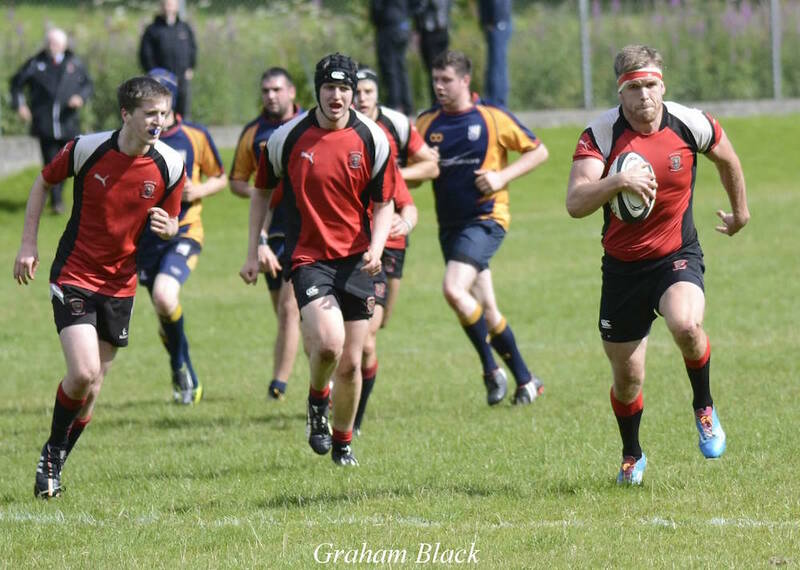 From the resulting line-out, Linlithgow won a penalty and cleared the danger. Five minutes later, a dangerous Carrick kick-ahead had to be tidied up with good defensive work by Stuart Bell and Cal Thomson. 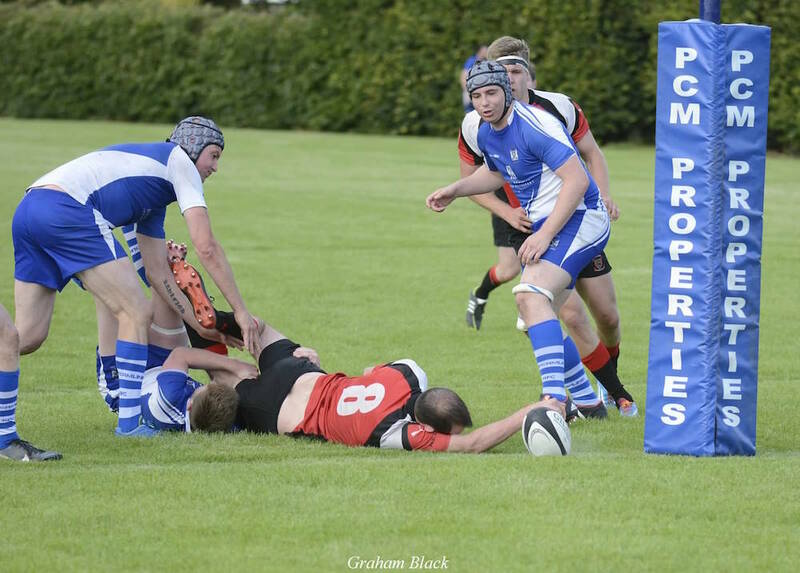 The Ayrshire side pressure continued and they were over the try-line when Chris Bredin saved a try making a superb tackle to bundle the Carrick player into touch. It was no surprise then when, after twenty minutes, the visitors took the lead. From solid scrum the ball was moved to the left again and this time the winger raced over the line to touch down. The score was converted with a good kick. The Reds’ defence was called into action in the run up to half time as the pace of the visitors’ attack did not slacken but Linlithgow held out to reach half-time trailing 7-0. The pattern of the game was interrupted after the interval by a good Reds’ drive that took the play into the Carrick half but, in a scrappy period of play, the ball was kicked loose by the Reds towards their own try line. 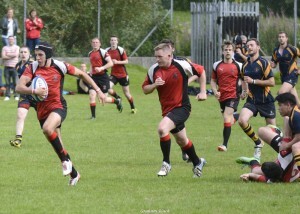 Carrick chased the ball in numbers and scored again, followed by another successful conversion. There followed two dangerous passing moves up the left again but both resulted in Carrick errors. A try was not long delayed, however. Unfortunately, it came from another piece of loose play from the home side when the pack won its own scrum close to the try line but the Carrick scrum half managed to secure the ball and dive over. This, too, was successfully converted. The Reds were stung into some form of reply and they won a line-out close to the Carrick line. The forwards won the ball and drove it over the line for Kenny McKenzie to score. The conversion sailed past the post. The Reds were pushed back on to the defensive again and, when they tried a passing move to turn defence into attack, a Carrick interception enable the visitors to score a fourth try close to the posts, leaving an easy conversion. 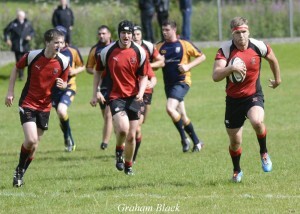 The game was closed off when, in last play, Linlithgow tried to run in a consolation try but conceded a penalty. Carrick, in turn, chose to run the ball and took the ball out wide to allow their winger to run in a try from well out. The excellent Carrick kicker missed for once, bringing the final score to 33-5 for the visitors. It was a frustrating day for the home side and the players will hope that they have managed to work the mistakes out of their system in this pre-season game before the league begins in earnest in two weeks, with a home game against Forrester. 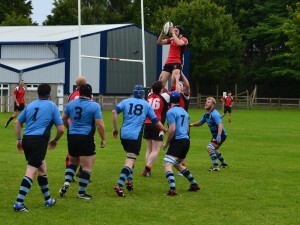 The Reds 1s and 2s visited Dunfermline for pre-season matches on Saturday (15 August). The day was spoiled by injuries to three players. 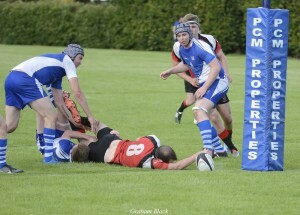 Photo shows centre Scott Watson stretching out for a try. The Reds welcomed Portobello to Mains Park for their second pre-season trial match. Once again, the match was split into four 20 minute periods. For the first two, Portobello won a fair share of possession and their defence was strong and well organised against the Reds attacks, with only a solitary try by Scott Watson, converted by Jack Frame to trouble the scorers. The Reds were able to mix things up with nearly 30 players available and, when they put out a strong line-up in the third period, the Porty defence began to creak. Scott Watson claimed his brace being up in support of a fine Euan Richardson break and there was a fine try from Jack Frame, rounding off some excellent handling. Cal Thomson also claimed a try with a well timed and angled run at pace to carve open the defence, with Jack Frame converting. Robbie Thomson did everything but score towards the end of the match with an alert piece of play from just inside his own half. In trying to pick up his own kick ahead just short of the Porty line, he managed to trip over his own feet, stumbling and falling just short of the line. To add insult to injury – he hurt his knee in the process – he was penalised for playing the ball on the ground! A good run out for the Reds and a strong showing from Portobello, who looked to have recovered from some of last season’s weaker showings and should be strong contenders to bounce back up to BT East 1 next season. 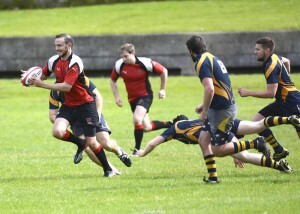 The Reds had an excellent first run-out of the season against Queensferry RFC in Scottish summer weather conditions (!) on Saturday 1st August on Lower Mains Park. The run-out was split into four sessions to give maximum opportunity for participation from the senior squad of 1st and 2nd XV players. Although tiring towards the end, Queensferry gave good account of themselves and claimed three points through a well-struck penalty. This Saturday, the Reds will welcome Portobello to Mains Park for their second pre-season match.